When our troops are called to serve their families must rise to meet the challenges of service as well. To thank them Cheerios and the USO have partnered in a postcard campaign that spreads Cheer directly to these honorable military families and supports USO programs. During the months of October and November, 2011, specially-marked boxes of Cheerios cereal will feature Cheer postcards on the front of the box. 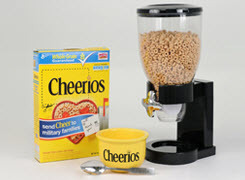 Consumers can simply cut out the postcard from the Cheerios logo, write a message of thanks on the back, add a stamp and mail the pre-addressed card to the USO. The USO will deliver the Cheer card to military families across the country. Sending a "Cheer" postcard is a simple way to say thanks and lift the spirits of our country´s military families. So, take a moment out of your day to spread some Cheer and send a message of thanks! My kids and I LOVE cherrios! It is our favorite breakfast. Cheerios are the only breakfast cereal I will eat dry or with milk. They are wonderful to snack on as well. And kids love them!!! I always keep Cheerios stocked in my house. I love Cheerios and buy them all the time! They were one of my favorites as a kid, and still are. Cheerios is a staple in our household. We always have at least a couple of boxes in the pantry! Cheerios is the only cereal I eat and I always start my day out with a bowl. We are huge Cheerios fans around here!! My family loves Cheerios! it's one of our favorites! Cheerios are the only low sugar choice in our house. Hubby and I are both Type 2 diabetics. It's our favorite! We've always loved Cheerios at our house. We don't like sugary sweet cereals and Cheerios is just right...I also eat it mixed with yogurt :) Thanks for the chance to win! I would win this for my son. My son love Cheerios. So does my hubby but not as much as my son. He would love this. How much we love Cheerios? You can always find them in our pantry! We eat them in breakfast, as snacks, all the time! I love love love Cheerios! We love Cheerios, especially honey nut cheerios. 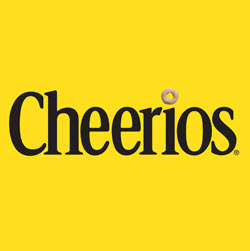 I love Cheerios. It has been a favorite since I was young. I love Cheerios so much that when we are not eating them for breakfast, we take them with us in the car as a snack! I thought I loved Cheerios, but my son really takes that prize. His favorite are the Honey Nut Cheerios! I've loved Cheerios since I was a kid! My daughter loves Cheerios...its a house staple!